CORNELIUS S. HURLBUT, JR., Harvard University, Cambridge, Massachusetts. The 17th International Geological Congress was held in Moscow during the latter part of July 1937. Geological trips to various parts of the Soviet Union were offered to the members both before and after the meetings. The pre-Congress trip of most general interest to the mineralogist was the "Northern Excursion," which began at Leningrad and went northward through Karelia into the Kola Peninsula. The members of. this trip felt especially privileged, since it was the first time since the revolution that foreigners have been permitted in that section. This region has long been known for its large number of unusual minerals, and recently, because of the extensive exploration under the Soviets, many new mineral localities have been discovered. Within the past decade it has taken on a far greater significance due to the discovery and commercial exploitation of large deposits of apatite. It is well recognized by the leaders of the present plan for industrialization of the U.S.S.R. that a factor of prime importance is the development of the natural resources. Consequently, geology is a favored science and no expense appears to be spared in furthering its ends. With such governmental support prospecting is frequently carried far beyond the limits that would be considered economic in a capitalistic country. Thus, extensive prospecting may yield nothing of commercial value, but it affords an excellent opportunity for the mineralogist and the student of paragenesis. Fig. 1. 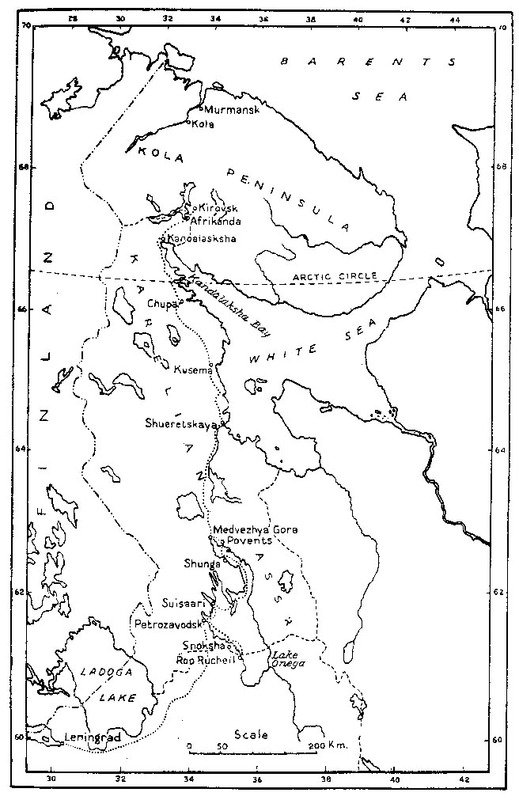 Index map of the N.W. portion of the USSR. The dotted line indicates the route taken by the "Northern Excursion"
Shunga. The portion of the excursion through Karelia was devoted mostly to a study of the pre-Cambrian. Only three of the older mineral localities were visited, the first of which was Shunga on the west shore of Lake Onega. It was here that the bituminous mineral shungite was discovered nearly 100 years ago and was subsequently mined as a fuel. From the present abandoned appearance of the mine one gathers that the mineral at present has little commercial value, although it is stated in the guidebook that the best varieties can be burned under forced draft. The workers on shungite have described three varieties based on the amount of carbon. The averages of the carbon content given for the three varieties are: 1 with 92%, 2 with 56%, and 3 with 29%. The varieties 2 and 3 are considered as members of a series of bituminous slates. However, the purest variety associated with calcite, strontianocalcite, and pyrite is believed to have formed by sublimation, or from a liquid solution. These solutions originated by the action of intrusive diabase on the less pure varieties. The most interesting specimens collected at Shunga are calcite veins implanted with small, crystal-like masses of shungite. Shuyeretskaya. The second mineral locality visited in Karelia was near Shuyeretskaya village on the west shore of the White Sea. Here is found a coarsely crystalline gedrite-biotite-garnet schist as one member in a series of metamorphic rocks. Imperfect crystals of garnet (grossularite, almandite, pyrope), although making up only 5 to 10% of the rock, are most striking, for they vary from half an inch to three inches in diameter. Most of the crystals contain many inclusions, chief of which is cyanite. In addition to the garnet, coarse crystals of cyanite, gedrite, quartz and biotite are also present. Chupa. For 300 kilometers southeast of Kandalaksha along the west shore of the White Sea is found a series of Archean crystalline schists and gneisses into which granite pegmatites have been injected at fairly regular intervals. These pegmatites have long been known and mining began at an early date for muscovite. In fact, it was white mica from this region that originally received the name muscovite. Altogether there are over forty separate localities where pegmatites of commercial value are known. Of this number, the members of the Congress were scheduled to visit three, but due to stormy weather, saw only two. They were in the Chupa fjord district, where there is not only the greatest concentration of pegmatite veins, but also the largest commercial deposits. Chupa is located on the railroad at the head of a fjord about 25 kilometers long. A small steamboat took the party down to Ambarnaya Bay nearly at the end of the fjord, where within a short distance of one another are two large pegmatites that have been developed under the Soviet regime. The larger one, the "Samoylovich" vein, is the only one now worked. There the minerals consist of large blocks of pink microcline-microperthite, quartz, and plagioclase with small amounts of biotite. Other minerals, among which are pyrite, uraninite, magnetite, and calcite, are decidedly subordinate. The mining methods are very primitive, with even the drilling done by hand; but, in spite of this fact, over 100,000 metric tons of material have been excavated in seven years. Both feldspar and quartz are mined and shipped for use in the ceramic industry; and, since these two minerals make up nearly the total bulk of the pegmatite, there is little waste. The quartz is shipped 3,200 kilometers (2,000 miles) to its place of consumption, and this, coupled with the obvious high cost of hand mining, would make it a very expensive product if judged by capitalistic standards. The "Eighth March" vein, the other pegmatite visited, is 1.5 kilometers from the "Samoylovich" vein. Here the chief minerals are white microcline and quartz, but a small amount of a purple muscovite of good quality is also recovered. The microcline is present in enormous crystals, the outlines of which can be seen on the wall of the abandoned quarry measuring six to eight meters on a side. Afrikanda. The first locality visited in the Kola Peninsula was Afrikanda, which was of considerable interest to the mineral collector. A pyroxenite body with segregations of titaniferous ores cutting the preCambrian schists is associated with alkaline pegmatites. Within recent years literally kilometers of trenches from one to three meters deep have been dug over an area of about 11.5 square kilometers, and channel samples taken of the bedrock. In this way a fair-sized body of titaniferous magnetite has been developed, although no mining has been done up to the present time. However, in the course of prospecting, a clear picture of the rock relations has been obtained and a score of minerals discovered. All of the exposures visited were those developed by trenching. The main mass of the body is a fine-grained pyroxenite whose crystallization was followed by the intrusion of a coarse-grained pyroxenite near the central portion. This coarse rock contains rounded xenoliths of fine-grained peridotites with segregations of titano-magnetite and knopite and finely banded melilite olivinites. Due to random orientation of the banded xenoliths, they are believed to be an eruptive breccia older than the pyroxenites and not segregations within it. Numerous veins of alkaline pegmatites cut the complex of coarse-grained pyroxenites and in places have reacted with the older rock, forming a hybrid that approaches the composition of ijolite. Since these pegmatites carry titanomagnetite and knopite and are confined to the central portion of the intrusive, they are considered as formed from the "residual melt of the ultra-basic magma." The "ore minerals," knopite and titano-magnetite, are found most abundantly as segregations within the xenoliths and as accumulations surrounding the pegmatite veins. 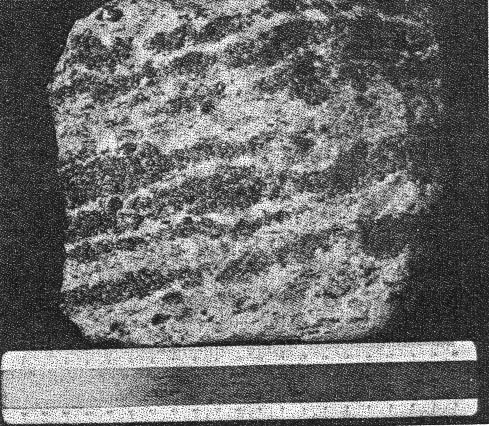 In addition, knopite is disseminated through the fine-grained pyroxenites. These two minerals are usually massive and difficult to tell apart, but in places knopite is found in small octahedral crystals. An extremely interesting rock making up some of the xenoliths is an olivinite carrying over 24% melilite. The melilite is found both as isolated crystals several millimeters in diameter and as dense whitish gray bands across the dark olivine and massive ore minerals. The alkaline pegmatites are composed mostly of nepheline and pyroxene with schorlomite, knopite and titano-magnetite. The crystallization in places is extremely coarse, for roughly cubical fragments of nepheline from single crystals were found measuring 18 centimeters on a side. In addition to the above-mentioned minerals, prehnite, calcite, and natrolite were found locally and are believed to have been formed during a late phase of the pegmatite development. With such an abundance of titanium and calcium present in the Afrikanda intrusive, it seems strange that there is so little sphene. It was found only at one locality, where it was in yellow crystals associated with calcite. The Khibine Pluton. A visit to the Khibine pluton in the central part of the Kola Peninsula was the culminating point of the Northern Excursion. This offered a rare opportunity for the petrographer and mineralogist to see, although in a cursory fashion, a unique petrographic province with its corresponding unusual mineral associations. 1. Alkaline syenites, fine-grained and medium-grained nepheline syenites. 2. Massive chibinites and their vein facies. 3. Trachytoid chibinites and their vein facies. 4. Rischorrites (poikilitic nepheline syenites). 5. Ijolite-urtites, malignites and lujavrites. 6. Massive and trachytoid foyaites; fine-grained and medium-grained, micaceous, aegirite-hornblende-nepheline syenites. Because of the large size of the pluton and the ruggedness of the country, the opportunity to make a complete traverse from margin to center was not presented. Instead, three separate excursions, in the more accessible parts of the body, gave a composite cross section. Although all the transportation facilities available were placed at the disposal of the Congress, it was necessary to do considerable walking to get a picture of the Khibine tundra. It is a young country in the process of development, and roads are few. At the Museum of Science and Industry at Kirovsk there is an excellent exhibit of all the minerals found in the Kola Peninsula. There, one can see over 100 minerals found associated with the rocks of the Khibine pluton, of which 17 are species originally described from there. The list is characterized by many zirconium-niobium-titanium silicates. Although on the excursions less than a third of the exhibited minerals were seen, the museum was a good starting point to show the visitor what might be expected in the field. At Kirovsk, as in many other places in the Soviet Union, great care has been taken to enlighten the visitor on the natural history of the region; and one cannot but marvel at the completeness of the exhibits found in a town only seven years old. An inspection of the Kukisvumchorr apatite mine near Kirovsk was a treat to the geologist and mineralogist alike, and showed Soviet mining at its best. The mine is located on a mountain spur between two glacial valleys in a great lens of apatite-nepheline rock. This sheet-like lens is found at the contact between underlying ijolite-urtites and overlying nepheline syenites (rischorrites). It is approximately 4 kilometers long, varies from 150 to 200 meters in thickness, and dips toward the center of the pluton at an angle averaging 67°. With such gigantic proportions, the estimated ore reserve of two billion tons does not seem a gross exaggeration. Fig. 2. The Kukisvumchorr apatite mine. The ore body from an economic point of view may be divided into two parts, the upper third a rich zone and the lower two-thirds a poor zone. The following table taken from guidebook (p. 107) shows the qualitative mineralogical composition of the two zones. Six years of mining has produced the great scar on the mountain side shown in Fig. 2. Surface work, however, is being gradually abandoned, and within a few years it is planned to have only underground mining. The chief reason for this change is the long arctic winters that leave only a short period for outside work. At present there are 30 kilometers of underground workings. Those haulage-ways through which the excursion proceeded were large and well lighted, and driven almost entirely through ore. The ore is hauled by electric engines to a central portion of the mine and dumped onto a grizzly over a large glory hole. It is drawn from below into standard-gauge ore cars, and thence transported about 5 kilometers to the mill at Kirovsk. None of the Congress members was permitted within the mill, nor told the milling process. However, it was learned inadvertently that the apatite is separated from nepheline and other minerals by flotation. 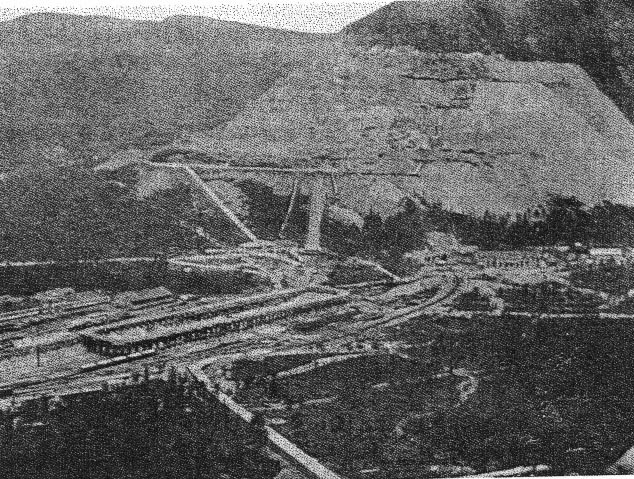 The visit to the apatite mine was on "rest day," so no mining activity was seen; but, during the remaining five days of the Soviet six-day week, work is carried on for 24 hours a day. During 1936 about 2,000,000 tons of ore were mined, of which about one-fourth was exported. Charts in the museum in Kirovsk showed that each year Russia supplies more and more phosphate to the other European countries. Although most of the apatite concentrate is used in making superphosphate in the conventional manner for fertilizer, some of it is ground extremely fine, and used directly with no processing at all. It was stated that, if used in this way, the beneficial effects of the phosphate would last for four years. Although a booklet has been circulated telling of fifteen different ways that nepheline, the chief tailings product, is used, one of the mine geologists said that most of it is waste. The apatite in the best grade of ore is a light green, with a sugary texture that stands out in contrast to the dark green, more massive nepheline. Some coarse apatite reaching a grain size of 5 millimeters was seen, but is less common. The most spectacular ore is banded with alternating layers of nepheline and apatite (Figs. 3 & 4). Locally the bands give the appearance of a dome-shaped deposit, but the strike and dip vary markedly from place to place and no generalization as to structure can be made. Other ore has a spotted or mottled appearance caused by segregations of the minerals, while still other is an intimate mixture. Fig. 3. Mine face showing banding of apatite ore. Fig. 4. Specimen of ore taken from the face shown in Fig. 3. The light bands are apatite, the dark bands nepheline. As indicated in Table 1, sphene is a common constituent of the ore, found usually in pinkish masses, but in places is seen in small prismatic crystals. In certain areas a pegmatitic phase with a coarse crystallization of the lesser ore constituents was seen. Large nepheline crystals and coarse-grained aegirite, aenigmatite, sphene, and eudialite are surrounded by the sugary-textured apatite. A large number of other minerals, including sulphides, lepidomelane, secondary generation aegirite, calcite and natrolite are reported to be found in veins crosscutting the ore body. Across the valley, east of the Kukisvumchorr apatite deposit is the Yukspor apatite deposit located in the continuation of the great sheetlike lens of ore. Here the excursion followed a prospecting trench up the mountain side across the strike of the ore body, and was thus given an excellent opportunity to observe the changes within it. Near the lower contact, apatite, urtite and ijolite bands alternate with one another making up the low-grade portion of the ore. As one goes higher in the section, the apatite bands are of greater thickness and make up increasingly higher percentages of the ore body. Near the hanging wall is a concentration several meters thick of nearly pure prismatic sphene. A mine has been opened to work this sphene concentration, and a brief visit to some of the workings gave a cross section similar to that seen on the mountain side. In a crosscut the relations within the ore body were even better shown than on the surface. Here one could observe an increasing content of sphene in the apatite as one approached the hanging wall. There was also a concentration of sphene seen in the overlying rischorrites. Aside from the sphene concentration, the mineralogy is similar to the Kukisvumchorr deposit across the valley. Little could be learned as to production of sphene. The only information was that the titanium is used in the chemical industry and as a paint pigment. It is interesting to note that the manager of the sphene mine is a woman and that about half of the laborers, as elsewhere in Russia, are women. Of considerable interest to foreign members of the excursion was a visit to the Yukspor lovchorrite deposit, where a mine of considerable proportions has been opened to extract this unusual mineral. Lovchorrite is an amorphous silicate of calcium, titanium, and rare earths, and has thus far not been found outside the Khibine tundra. Lovchorrite has been found in several places within the pluton, but in general it is confined to two arcs; one interior, the other exterior. That of the exterior arc is found in pegmatite dikes within the trachytoid chibinite, and was not seen. The interior arc is located between the rischorrites and foyaites within a narrow intrusive band of aegirite-hornblende-nepheline syenite. The lovchorrite is found in pegmatites cutting this syenite near the rischorrite contact. High on the north wall of the Lapp valley in a prospecting pit in one of the pegmatites was found lovchorrite, rincolite (the crystalline variety of lovchorrite), pink fibrous sphene, eudialite, feldspar, nepheline, aegirite and zeolites. The concentration here was not considered great enough to be of economic importance. The section of the interior arc where lovchorrite is mined is in the middle part of Yukspor mountain about 7 kilometers from the apatite mine. The mine, located well above timber line at an elevation of 830 meters, is 180 meters above the village in the valley and is reached by a covered stairway. Work has been carried along an essentially parallel set of pegmatite dikes. Where the dikes approach one another is found the greatest concentration of lovchorrite. The casual inspection given in the short time available showed the pegmatites to be composed essentially of microcline crystals and coarse aggregates of aegirite. In places, lovchorrite and arfvedsonite filled the interstices between these minerals. Sphene, astrophyllite, apatite and rincolite were also collected, but in minor quantities. Although the number of minerals seen was small, the list of those found in this mine is a long one and includes several found only there. 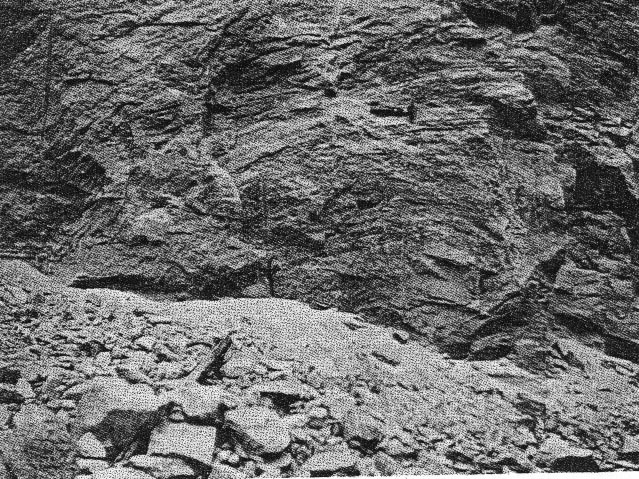 Even though several piles of ore containing specimens rich in lovchorrite were seen and promptly set upon by Congress members, the appearance of the mine suggests that the average ore must be very low grade. One cannot but wonder whether the rare earths derived from this ore would pay for their extraction, and if Soviet Russia is not the only country in the world where such a mine could exist.